We will start this wonderful adventure touching down in India for a whirlwind visit to one of its most iconic sites, the Taj Mahal. Steeped in history and mythology it will simply take your breath away. After this it will be a whirlwind visit through the streets of Old and New Delhi and then before we know it we will be winging our way to Bhutan – the land of the “Thunder Dragon”. On arrival you will simply step back in time and embrace the pure energy of Bhutan as we travel over spectacular mountain passes, through valley floors and onto ancient cities where you will experience a mixture of modern development alongside ancient traditions. 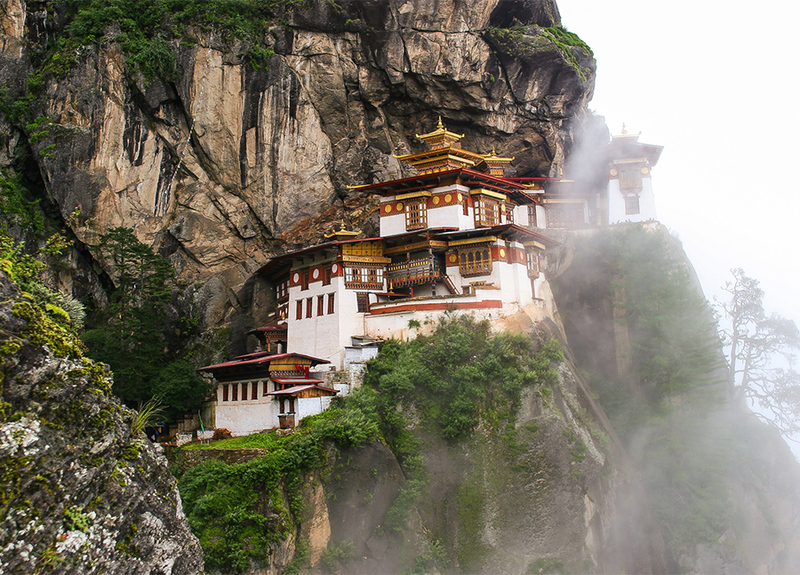 You will get the chance to climb up to one of Bhutan’s most famous monasteries, perched on the side of a cliff 900m above the Paro floor. It is said the guru Rinpoche arrived here on the back of a tigress and meditated at this monastery and hence it is called “Tigers Nest”. Famous for its incredible art, treasures, spirituality and buddhism this journey will be a precious moment in time as you explore the monasteries, interact with the people and learn to listen to your inner self as you reconnect with the wisdom shared throughout this wonderful land. Having opened its borders for the first time less than 40 years ago it has gained an almost mystical status as a real life Shangri-la with emphasis on the spiritual growth of its people, the preservation of nature and the stunning monasteries scattered through its lands and most importantly the happiness and welfare of its people. Very few tourists get the chance to journey across into Eastern Bhutan where we will get the opportunity to see the great one-horned rhinoceroses and a great selection of wild life in the most stunning nature setting. We have so many magical experiences awaiting you on our very special spiritual pilgrimage through the Kingdom of the “Thunder Dragon”. We will be in touch soon with any updates on this tour however please feel free to get in touch if you have any questions. * The insurance is underwritten by AIG Australia Limited ABN 93004727753 AFSL 381686. Lifestyle Journeys does not and cannot provide any advice, recommendation about insurance. Cover is subject to terms and depends on (i) policy type and (ii) whether cover is availabile for the region where you may travel.